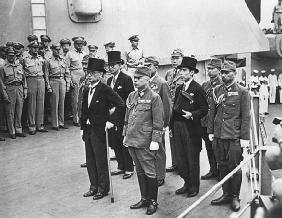 Mamoru Shigemitsu and General Yoshijiro Umezu, with delegation, witness. A suspending or cessation of hostilities between belligerent nations or forces for a considerable time. An armistice differs from a mere "suspension of arms" in that the latter is concluded for very brief periods and for local military purposes only, whereas an armistice not only covers a longer period, but is agreed upon for political purposes. It is said to be general if it relates to the whole area of the war, and partial if it relates to only a portion of that area. Partial armistices are sometimes called truces but there is no hard and fast distinction. Armistice Day originated as a day set aside by the United States, Great Britain, and France to commemorate the signing of the armistice on November 11, 1918, that brought an end to World War I. After World War II, it became a day for tribute to those who lost their lives in that conflict as well. In Canada, it became known as Remembrance Day, and in Britain the Sunday closest to November 11 was declared Remembrance Sunday to honor the dead of both world wars. In 1938, the day was made a federal holiday in the United States. In 1954, after the Korean War, President dwight d. eisenhower signed an act of Congress (5 U.S.C.A. § 6103 (a) ) to change the name of the holiday to Veterans Day "to honor veterans on the eleventh day of November of each year … a day dedicated to world peace." Thus, Veterans Day now honors all U.S. veterans of all wars. From 1971 to 1977, the holiday was celebrated on the fourth Monday in October, but in 1978, the traditional date of November 11 was restored. Veterans Day celebrations in towns and cities in the United States usually include parades, speeches, and floral tributes placed on soldiers' graves or memorials, with special services held at the Tomb of the Unknown Soldier in Arlington National Cemetery, in Arlington, Virginia, outside Washington, D.C. Group naturalization ceremonies, in which individuals are made citizens of the United States, have also become part of Veterans Day celebrations. ARMISTICE. A cessation of hostilities between belligerent nations for a considerable time. It is either partial and local, or general. It differs from a mere suspension of arms which takes place to enable the two armies to bury their dead, their chiefs to hold conferences or pourparlers, and the like. Vattel, Droit des Gens, liv. 3, c. 16, Sec. 233. The terms truce, (q.v.) and armistice, are sometimes used in the same sense. Vide Truce. On the centenary of the Armistice we will give thanks for peace and for those that returned, and remember the sacrifice of the 800,000 soldiers who died. The armistice, signed in July 27, 1953, brought a ceasefire to the 1950-53 Korean War. ON THIS DAY LAST YEAR: Prince Harry led the country in remembering the fallen on Armistice Day, laying a wreath at the National Memorial Arboretum. Some 98 years after the first Armistice Day was held, schools, workplaces, shopping centres and public buildings across the country still fall silent at 11am to remember those who have died in conflict. MPs will be required to consult community organisations or create a Community Consultation Committee to get the communitys views on how best to commemorate the centenary of the Armistice. In the United Kingdom, people commemorate Armistice Day with a two-minute moment of silence in London's Trafalgar Square, (http://www. Special assemblies were held all week to discuss the relevance of Armistice Day. The holiday was officially the date the armistice was established between the opposing forces in The Great War. One day, while reviewing a trial record, LTC Levie was informed that he was to report the following day to the UN Command Armistice Delegation, and that he would serve as a "Monitor" on the Delegation Working Group. Kevin Forbes, Royal British Legion community fundraiser for North Wales, was at the Royal Welsh Memorial on Sunday and the Armistice Day service in Queens Square, Wrexham yesterday said the two silence on both occasions was observed "impeccably". The stalemate eventually opened the way for armistice negotiations, which after long delay culminated in an armistice on 27 July 1953. Summary: TEHRAN (FNA)- Wednesday's edition of Rodong Sinmun, an official paper of North Korea's ruling Workers' Party of Korea (WPK), carries an article calling for the replacement of the Korean War armistice deal with Seoul by a formal peace treaty, reports said.